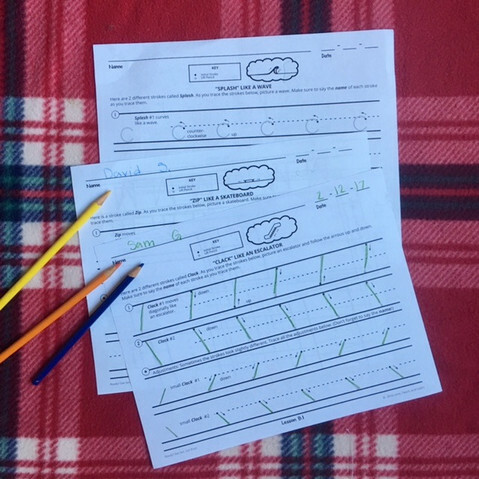 It’s Valentine’s Day and the handwriting curriculum that your students will fall in love with is finally here! And for the first 48 hours it will be half off! I talked about the mistakes I’ve made teaching handwriting and the power struggles that I’ve had with my son. 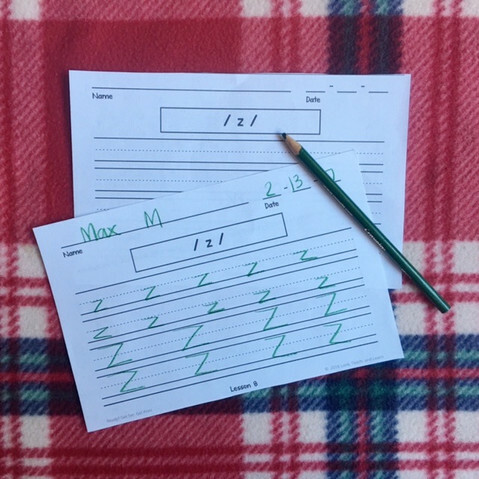 I also talked about why proper handwriting is so important to start with and shared what I thought the ultimate handwriting curriculum would contain. 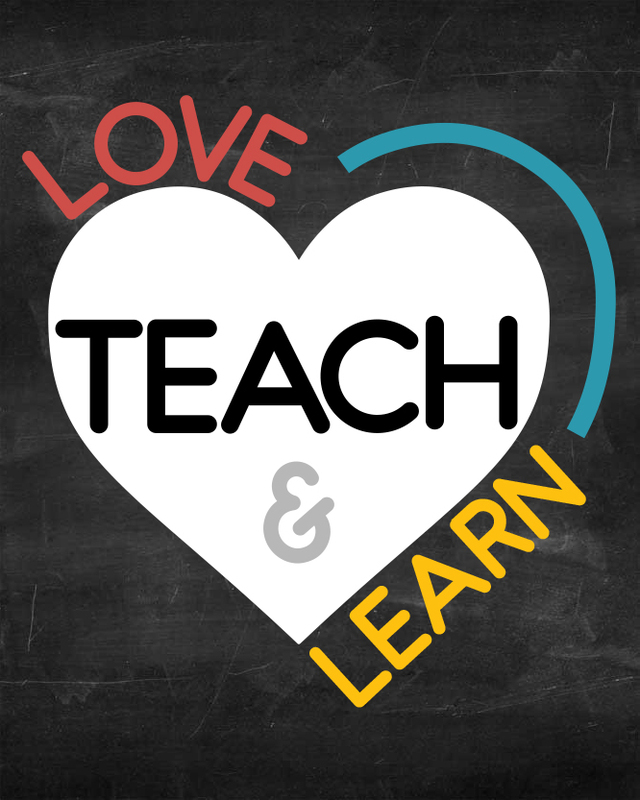 I compared a few popular curriculums and discussed what I enjoyed about them and a few things that I felt that they could’ve benefited from one another. Today, I’m going to share with you the details of the print handwriting packet that was inspired through my struggles with teaching handwriting using other curriculums. I created this packet with young learners in mind. It will engage your students and encourage them to imagine without the distractions of cutesy clipart. 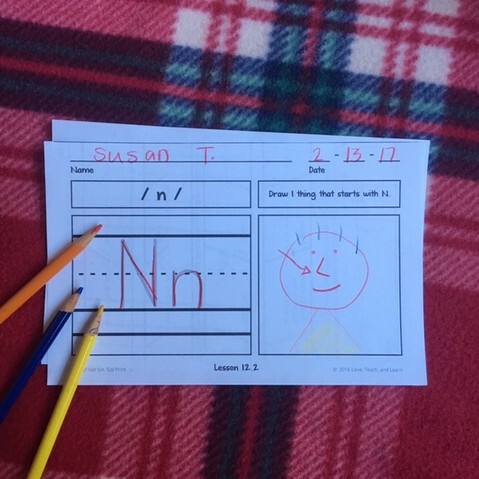 The first three weeks are dedicated to learning letter strokes. There are 10 strokes divided into 6 categories that are named after onomatopoeias: Ding, Zip, Clack, Boing, Swoosh, and Splash. The first four days are dedicated to learning two new strokes. As students trace each stroke, they will call out the category name the stroke belongs to. Once the strokes have been mastered and memorized, students move on to learn the stroke combinations that form each letter. This is where calling out stroke names become increasingly beneficial. As they call out the stroke names, they will begin to see a pattern of stroke combinations specific to each letter. This will guide them through each letter formation, helping the students memorize order and movement of each letter, ensuring mastery. Each lesson on letters include phonograms associated with the letter that is being introduced that week. 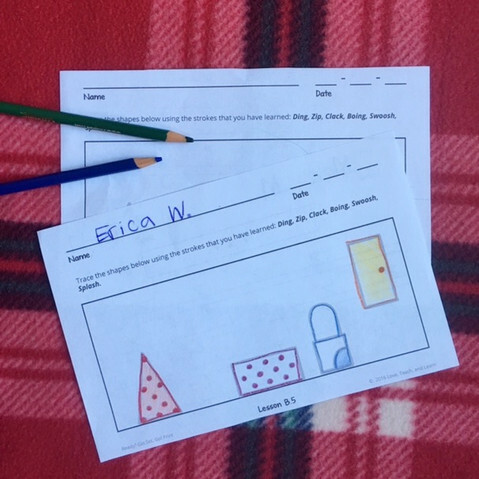 The last five mini-lessons are all half page sizes to ensure that the students focus on proper letter formation rather than struggling to get through the lesson. It is far more advantageous for students to make fewer correct letter formation, than it is to have numerous letters completed incorrectly. The second mini-lesson is a fun warm up (as shown in the picture below). 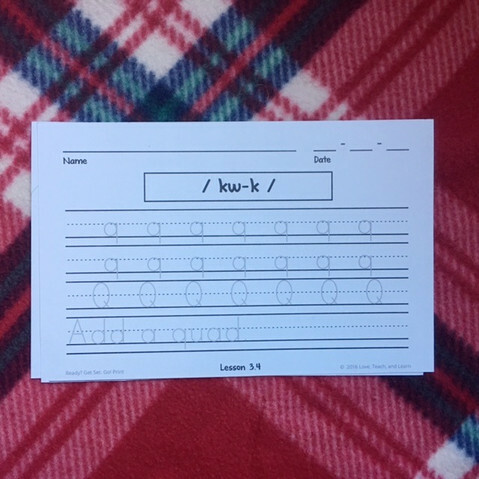 Students will trace a larger font of the letter of the week and draw a picture that begins with the sound of that letter. This is a great opportunity to talk exclusively about the letter sounds. 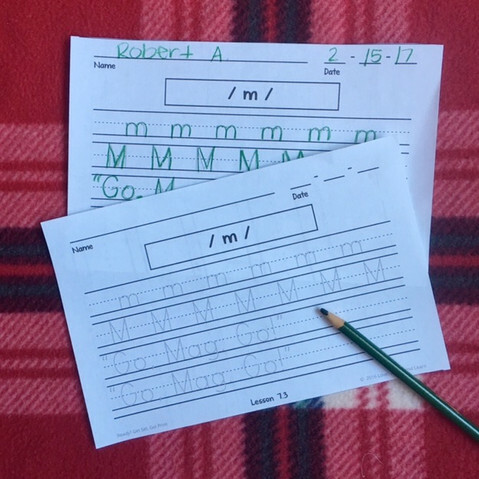 The third mini-lesson has one practice line for each letter, easing kindergarteners into handwriting practice. The last two lines are committed to reviewing letter previously introduced. The review line contains a variety of sentences, sentence fragments, and punctuation for practical application and opportunity to introduce/discuss other literature components. Take a look at the picture below to see an example of the third mini-lesson on letters. According to the review line on letter M lesson, this would be a great week to discuss quotation marks and exclamation marks. For older grade levels you can even discuss how we add a comma before or after a direct address. *Notice (at the bottom) that letter M is the seventh lesson. This means that letter M is the seventh letter introduced in the curriculum. The letters are ordered so that there is least letter confusion as possible, as well as to prevent confusion with letter sounds. The picture below shows us another example. 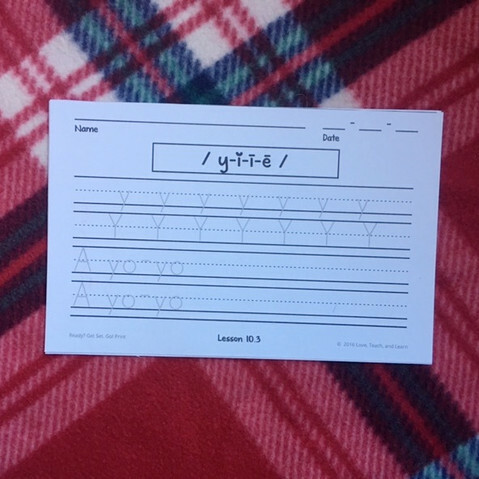 For the third lesson on letter Y, you could discuss fragment sentences and review what is required to make a complete sentence. The fourth mini-lesson (pictured below) for each letter has only one review line. Students double on their lowercase practice. Since lowercase is predominantly used in English literature, we place a slightly higher focus on those lowercase letters. FLUENCY : Students can use this line for more letter practice. MEMORY : Students can try to remember the spelling, grammar, and punctuation that was discussed that week and try to copy the sentence or sentence fragments that were previously reviewed. CHALLENGE : Students can try to create words with the letters that have taught. The last mini-lesson is a bonus. It is left completely blank (as shown in the picture below) with only the letter phonograms at the top of the page. 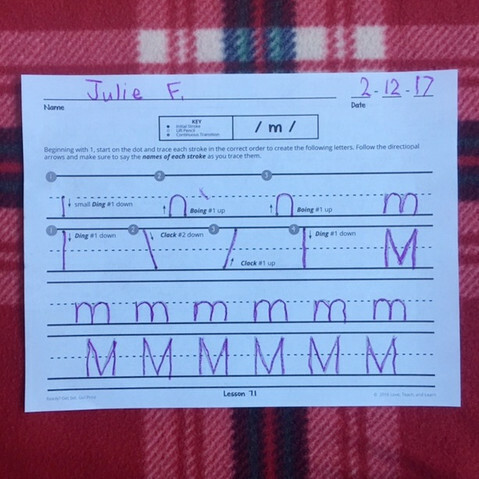 This is a great lesson for students to draw their best letter without any tracing help, but it can be used any way you like. If you’re looking for an engaging multi-sensory curriculum, then look no further! You kids will have so much fun learning, they won’t realize they were mastering penmanship skills. 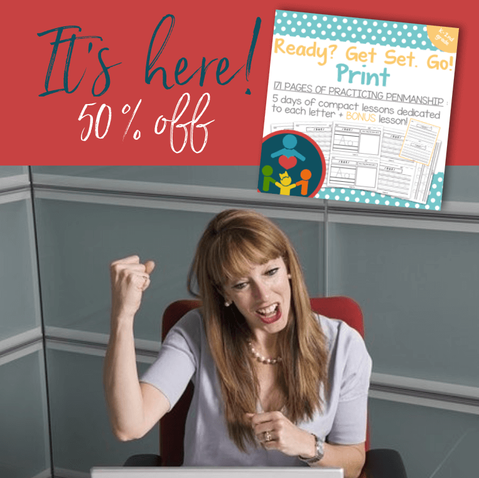 The print packet is available on Teachers Pay Teachers. I also plan on adding some fun flash cards and reference guide to go with the packet. So, if you want to stay up to date with my creations go ahead and click the green star at the top of my TpT store. Please, let me know if this was, in any way, helpful to you? 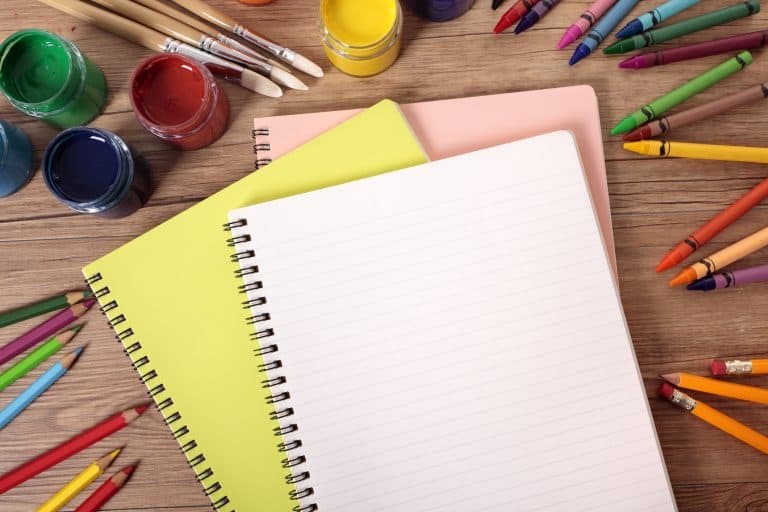 Maybe you didn’t need a new handwriting curriculum, but it sparked some ideas of how you can make your current one better? Please, share with me in the comments below, how this post might have inspired you. 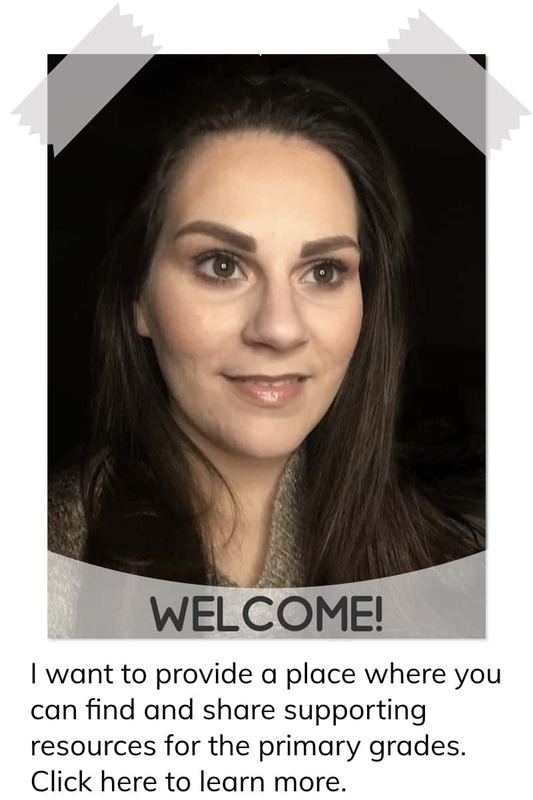 I love hearing your stories!